Dallas Cowboys owner and general manager Jerry Jones will not bend on his edict that his players will stand for the national anthem, but he wishes President Donald Trump would not bring the controversy up as often as he does. Jones was asked Wednesday if this is a playoff or bust year for Jason Garrett. Jones replies with an emphatic no. The Cowboys begin practicing today in Oxnard. The Stars have inked Matias Janmark to a one year deal while losing Dan Hamhuis to the Nashville Predators. One day after acquiring Zach Britton from the Orioles, the Yankees are said to have interest in Cole Hammels. The trade deadline is less than a week away. For the second straight night, the A’s put together an impressive comeback in the final three innings. In the 9th Kris Davis hit his second game-winning home run in a row. And his second homer in the game as Oakland won 6-5. Texas will try to avoid the sweep tonight on 1490AM and 96.3FM KPLT. Pregame at 6:30. First pitch at 7:05. The Atlanta Falcons signed coach Dan Quinn and general manager Thomas Dimitroff to three-year contract extensions Wednesday morning. Both Quinn and Dimitroff are now signed through 2022. Atlanta Falcons star receiver Julio Jones will report to training camp on Thursday, general manager Thomas Dimitroff announced late Wednesday night. 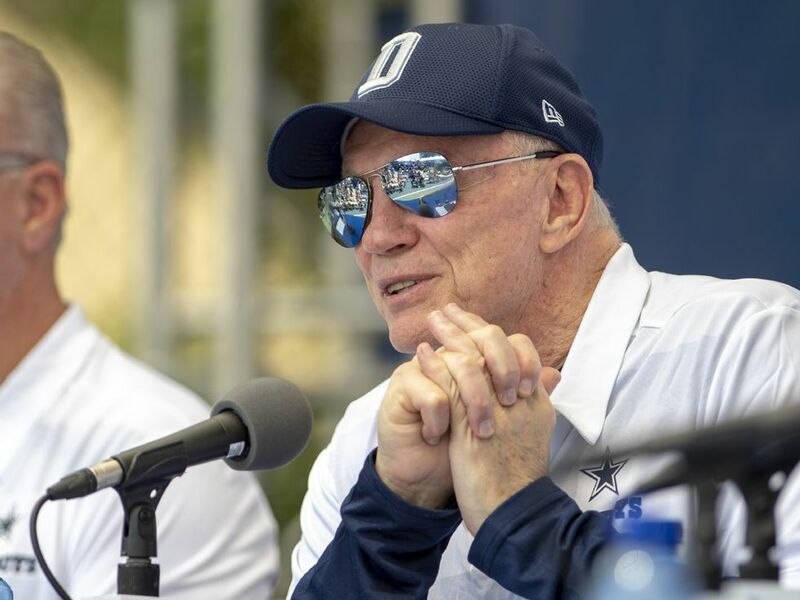 Team and league sources also said that both sides were working to resolve the contract differences that had Jones planning to hold out of training camp. The Cleveland Browns have talked about the possibility of acquiring Dez Bryant with Josh Gordon away from the team as part of his rehab, general manager John Dorsey said Wednesday. “Have we had discussions about Dez Bryant?” Dorsey said as he and coach Hue Jackson met the media one day before the opening of training camp. “Yeah, that’s natural. You’re going to have discussions like that. The Indianapolis Colts are planning on Andrew Luck, who missed the 2017 season while recovering from right shoulder surgery, to play in the team’s preseason opener, coach Frank Reich said Wednesday. Luck reported to training camp and will practice Thursday and Friday before taking Saturday off. He will practice Sunday during the team’s night practice. The Colts open their preseason schedule on the road against the Seattle Seahawks on Aug. 9. DEL MAR, Calif. — Triple Crown winner Justify was retired from racing Wednesday because of fluid in his left front ankle. Trainer Bob Baffert and Justify’s owners said caution over the horse’s ankle condition made it impossible to tell whether he’d be healthy enough to race by the fall.